The theory according to which it is desirable to sustain the body with vegetables and fruits, and abstain from eating animal food or any product thereof. Rab said that Adam was prohibited from eating meat. "Dominion" in Gen. i. 28 is interpreted as the privilege of using the animals for labor only (Sanh. 59b). But after the Flood, when the animals were saved in Noah's ark, the right of consuming them was granted to man "Every moving thing that liveth shall be meat for you; even as the green herb have I given you all things" (Gen. ix. 3). The only restriction was in the case of "flesh with the life thereof"; that is, flesh might not be taken for food from a living animal. Moses could with difficulty restrain the craving of the Israelites for the "flesh pots" of Egypt (Ex. xvi. 3). The manna, as a heavenly diet, could not satisfy them, and therefore Moses appointed a flesh meal for the evening (Yoma 75b). Again, the rabble among them "fell a lusting" and demanded more meat (Num. xi. 4). They were then supplied plentifully with quails from the sea, which caused an epidemic (Num. xi. 31-34; comp. Ps. lxxviii. 25-31). Moses limited the eating of flesh to certain kinds of animals, prohibiting those that were unclean (Lev. xi. 1-47). After the occupation of Palestine permission was given those who were too far from the Temple to eat the flesh of any clean animal that had been properly slaughtered (Deut. xii. 21). This is called "basar ta'awah" (= "meat of desire," or "meat of luxury"), meat not being considered a necessary of life. Daniel and his comrades were given pulse and water, and yet appeared in better health than those who were nourished with the king's meat and wine (Dan. i. 5-16). The prophet pictured a future when "the lion shall eat straw like the ox" (Isa. xi. 7). Isaac Abravanel, commenting on this passage, says that cruelty and ferocity are engendered in the animal that eats meat. The Rabbis objected to meat-eating rather from an economic than from a moral standpoint. The advice of R. Judah ben Ilai was: "Sit in the shade and eat onions; but do not eat geese and chickens, though thy heart may crave them" (Pes. 114a). A popular proverb in Palestine ran: "He who eats fat tails ["alita"] will be compelled to hide [from creditors] in the attic ["'alita"]; but he who eats vegetables ["ḳaḳule"] may rest quietly on the bank of the river [ḳiḳele"]" (ib.). The Rabbis, referring to Deut. xiv. 26, said, "The Torah teaches a lesson in moral conduct, that man shall not eat meat unless he has a special craving for it, and shall eat it only occasionally and sparingly." R. Eleazar b. Azariah thought that a man who is worth one maneh should provide his table with a pound of vegetables; ten manehs, with a pound of fish; fifty manehs, with a pound of meat; if he is worth 100 manehs, he may have a pot of meat every day. Rab followed the regulation of this tanna. R. Johanan, however, remarked that Rab came from a healthy family, but that people like himself must spend the last peruṭa to purchase the best nourishment (Ḥul. 84a). Because he did not eat ox-meat in the evening R. Naḥman was not in a condition to render a correct decision to Raba until next morning (B. Ḳ. 72a). On Sabbaths and holy days fish and meat furnished the daintiest morsels. R. Abba spent every Friday thirteen silver coins at thirteen different butchers' shops in order to get the best meats in honor of Queen Sabbath (Shab. 119a). Rabbi, however, would prohibit an "'am ha-areẓ" from eating meat, quoting, "This is the law of the beasts, . . . that may be eaten," etc. (Lev. x. 46-47); one who is studying the Law may eat meat, but an ignoramus may not (Pes. 49b). The modern question of vegetarianism is probably first discussed by I. B. Levinsohn, who justifies the strictness of the rules of "ṭerefah" on this account, and attributes the longevity of the generations from Adam to Noah to their vegetarian diet. The good morals and keen intellect of the Jews, he says, are largely due to their scant eating of meat ("Zerubbabel," iv., § 51). Dr. J. Kaminer, on the other hand, claims that the scarcity of meat among the Jews is directly responsible for many diseases peculiar to them; and he blames the exorbitant price of meat, due to the special Jewish meat-tax ("Seder Kapparot le-Ba'ale Ṭaḳsi" p. 77, note, Warsaw, 1878). 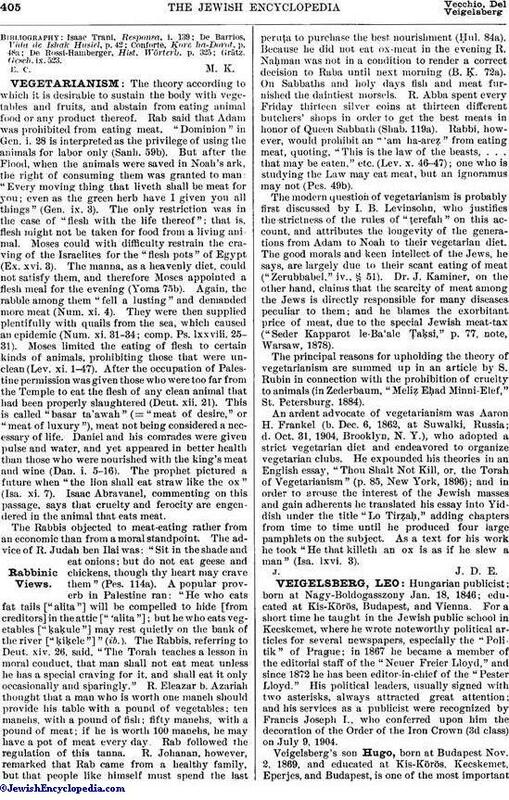 The principal reasons for upholding the theory of vegetarianism are summed up in an article by S. Rubin in connection with the prohibition of cruelty to animals (in Zederbaum, "Meliẓ Eḥad Minni-Elef," St. Petersburg, 1884). An ardent advocate of vegetarianism was Aaron H. Frankel (b. Dec. 6, 1862, at Suwalki, Russia; d. Oct. 31, 1904, Brooklyn, N. Y. ), who adopted a strict vegetarian diet and endeavored to organize vegetarian clubs. He expounded his theories in an English essay, "Thou Shalt Not Kill, or, the Torah of Vegetarianism" (p. 85, New York, 1896); and in order to arouse the interest of the Jewish masses and gain adherents he translated his essay into Yiddish under the title "Lo Tirẓaḥ," adding chapters from time to time until he produced four large pamphlets on the subject. As a text for his work he took "He that killeth an ox is as if he slew a man" (Isa. lxvi. 3).